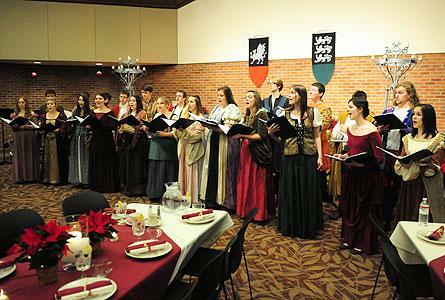 The feast featured fine food, a wassail toast, figgy pudding and a boar’s head procession. The auditorium was decorated in the manner of a castle’s grand feasting hall, complete with tapestries and suits of armor to help lend atmosphere. Even the wait staff was garbed in period attire. The program was led by Hope College faculty member Jim DeBoer and the Collegium Musicum student vocal ensemble.